Ever since the Defense Ministry named Gangjeong, a small village in Jeju’s Seogwipo, in June 2007 as the site for a strategic naval base with the approval of 87 villagers, hundreds of other residents have tried to nullify the decision, claiming the earlier vote was illegal. The struggle recently received renewed national attention, as opposition politicians and civic groups flocked to the fishing village to protest, dramatically increasing the impact of the peaceful sit-in being held by two to three dozen people. Five protesters including the villagers’ representative Kang Dong-kyun were taken to the police station for questioning last Wednesday after attempting to block construction work. The state prosecution is investigating about 70 people, 27 of whom were indicted, for obstructing public duty, and is pushing for a 280 million won damages suit against 14 villagers accused of hampering the construction. 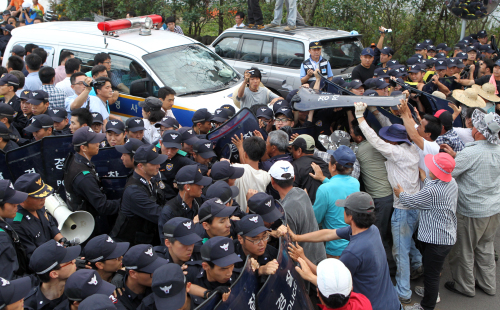 On Monday, the Jeju District Court accepted the petition by the government and the Navy for a provisional disposition against villagers and civic activists who impeded the construction. The court ruled that 37 people including Kang and five groups including the village council must not interfere with the petitioners’ use or occupation of its land and waters, navigation of ships or aircraft, and that each of them would have to pay 2 million won to the petitioners every time they violate the court order. But the court dismissed the petition for prohibition of all acts in hindrance to the construction, saying it would infringe on the constitutional right to freedom of expression. The Navy had vowed to have public forces stationed as soon as the court accepts its petition. National Police Agency chief Cho Hyun-oh said in a media interview Monday that unlike in the cases of Ssangyong Motor and Yoosung Enterprise plants where hundreds or thousands of workers staged illegal strikes, there will be no major stationing of riot police in Gangjeong. But the possibility of a major standoff looms as the so-called “peace buses” continue to carry protesters into the village, with more to arrive on a chartered flight dubbed the “peace airplane” on Saturday. Negative views of the naval base spread nationwide after a film critic went on a two-month hunger strike and an independent documentary on the villagers’ struggle was produced earlier this year. The Navy said it would complete by 2014 a “military-civilian” compound on the island, 90 kilometers off the peninsula’s south coast, where a mobile fleet of up to 20 warships, including submarines, and two 150,000-ton cruisers can dock. The Navy says these naval vessels will protect shipping routes for Korea’s export-driven economy, which is dependent on imported oil, and enable the country to respond quickly to a brewing territorial dispute with China over Socotra Rock, a submerged reef south of Jeju that the Koreans call Ieodo. Both sides believe it is surrounded by oil and mineral deposits. The port will be open for temporary dockings to U.S. ships in East Asian seas, the Defense Ministry said, prompting many villagers and anti-base activists from other parts of the country to suspect that the naval base will serve less as a shield against North Korea than as an outpost for the U.S. Navy to project its power against China. Some even speculate that the U.S. could use it for another missile defense base capable of intercepting China’s intercontinental ballistic missiles. Opponents of the base also claim that it would cause environmental degradation, which would have a negative impact on the island’s tourism industry. Other villagers, however, support the base which they believe will boost the area’s economy. Kang has pledged to stop the protests if 51 percent or more of Gangjeong villagers approve of the base in a referendum. Some 140.5 billion won ― 14 percent of the total budget ― has already been spent on the initial construction work. The Navy signed contracts with two construction firms in January last year to build pier facilities, but significant progress is yet to be made, because of incessant obstructions. Five opposition parties, including the main opposition Democratic Party and the minor Democratic Labor Party, urged the government early this month to halt the construction and take into account public objections. In response to the opposition politicians’ news conference, the Defense Ministry reiterated its determination to complete the ongoing project, expressing concerns that the project has taken on political overtones and become entrammelled in an ideological dispute. Navy officials say the protests, which have cost the ministry nearly 6 billion won, are mostly run by people from outside Gangjeong, and some activists are spreading misleading information about the project to confuse the public. They said that because the U.S. already has an MD base in Okinawa, they do not need another base to cover the Northeast Asian region. Regarding speculation of U.S. military expansion on Jeju, the ministry said the U.S. would not be drawn to the Jeju base as it already has bases in Busan and Jinhae. It also added that the new base is part of efforts to reduce its reliance on the U.S. military. Proponents of the base’s construction also emphasize that it will shorten the time for Korean naval ships to reach southern sea spots when maritime disputes with China or Japan occur.